Understanding hot melt tank systems is no simple task. It usually takes years of experience to learn how to effectively manage adhesive systems and keep your packaging line running efficiently and effectively. Universal Systems SE understands that new line operators come into work and might need help learning which items to replace and how to replace them the correct way. That is why we offer technical support to all of our ProBilt™ customers! There are several maintenance tasks that we recommend be completed on a regular basis to keep your adhesive system free of char and debris, which is the number one culprit in bringing down a line. 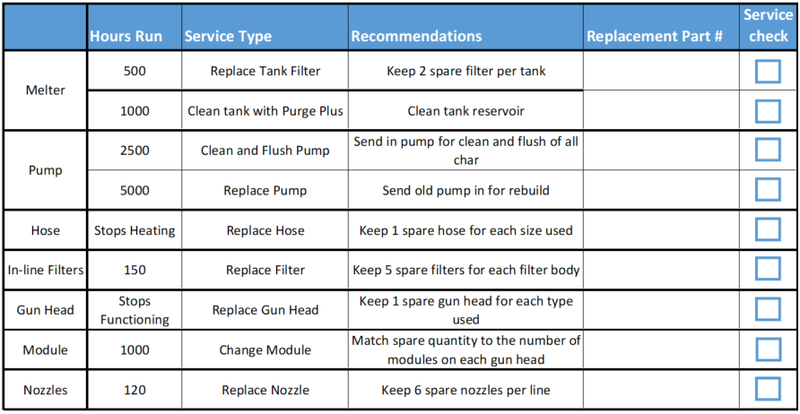 Below is an easy maintenance checklist that each line operator should have in hand. We recommend that you print this checklist out and give it to every shift that operates the packaging line. Keep in mind that changing out items such as gun heads, modules, filters and pumps all require you to clear the old lines and remove the air pressure before re-installation. Releasing the air pressure and removing all old adhesive will ensure that all seals stay intact and reduces the char transferred from the old to the new parts. If you need help changing out parts or have questions about which items need to be changed regularly, please call (561) 272-5442 or email sales@ussefl.com.